The momentum is there, despite some underlying problems. 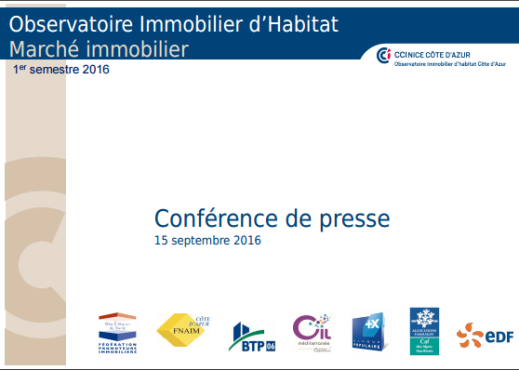 A press conference, organised by the French Riviera CCI, through its Housing Observatory, was held on September 15th 2016 to assess the situation regarding real estate in the first half of 2016. The positive momentum observed in the previous months is confirmed. While the number of properties for sale rose by 18% compared to the first half of 2015, the number of sales increased by 22%. Such figures (representing some 2000 properties) haven’t been seen since 2006, other than during the second half of 2011. These positive results are due, in particular, to a strong growth in the offer of blocks of housing for sale (+83%). As far as sales are concerned, significant growth was observed during this period in the sales of supported housing schemes (+62%), block sales (+53%), and the sale of housing priced at < 3 500€ m2 (+44%). Notwithstanding these results, the imbalance between supply and demand in the French Riviera should not be overlooked. Despite the current circumstances, prices remain relatively stable, with even a slight decrease in the average sales price per m² (-2%). The resale market is also experiencing a net increase in activity. A growth of + 17 was observed in the number of sales transactions in one year. Prices remained more or less the same. The recovery observed in the real estate sector in 2015, is continuing and will undoubtedly be confirmed at the end of the year, with, it must be added, no pressure on prices. The good health of the market is also reflected in an increase in building permits and number of construction sites started. These results can also be taken as a sign that real estate is once more regarded as a value – as a safe haven. Whilst these results are to be welcomed, they must be evaluated in the context of particularly attractive interest rates and significant financial and tax provisions, along with macroeconomic issues (growth, employment, demographics … ), and certain regional constraints.